Graphic and web designers surf the web in search of quality designs for their designing purposes. 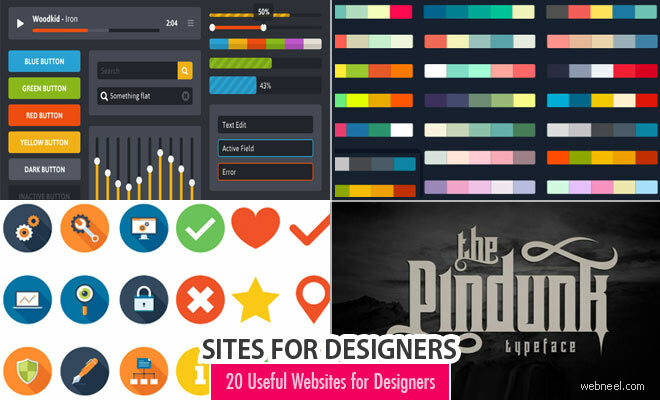 We have made their lives simple, by collecting some of the Top 15 useful websites which can be used by the graphic designers to create their web designing with. Icons, webdesign templates, banners, buttons and everything else is readily available, all that you have to do is download them and use them in your designs to make your work more precise and to produce quality work. Sometimes clients require the most craziest things like a different texture in the background or resizing the buttons or even a simple icon. You can browse through our collection of amazing free stuff which can be downloaded at ease and previews are very easy, since they are already pre-made templates and icons. However if you require some customization on some icons, you can contact the designers by visiting their websites and they are just a click away. Happy designing. UICloud is a project created by Double-J Design. It collects the best UI element designs from the internet all over the world and provides a search engine for you to find the best UI element that you need. We are aiming to create the biggest platform for designers to showcase their top user interface designs and for developer to get the best UI elements for their project easily and quickly. You can find free photos, free images, stock photos and stock illustrations. This website is every designer's dream, since they have free images in almost all categories and themes. If you want to share your photos, you can upload them too after resgistering yourself in their website. GoGraph offers flexible royalty free stock photography, vectors, illustrations, graphics, and stock footage at low prices. Purchase and download stock images immediately. Buy cheap stock photos, royalty free photographs and pictures and get immediate image file downloads. GoGraph also offers EPS vector illustrations, clipart digital artwork, clip art, stock footage, and video animation clips. Pexels provides high quality and completely free stock photos licensed under the Creative Commons Zero (CC0) license. All photos are nicely tagged, searchable and also easy to discover through our discover pages. Currently we cover over 25,000 free stock photos. And every month at least 3,000 new high resolution photos will be added. All photos are hand-picked from photos uploaded by our users or sourced from free image websites. 5,000+ High-quality free stock photos from more than 25 sources. If the tags are not relevant, you can add your own tags to the images. Free, high-quality stock photos are great. But its super difficult to find them because they are not tagged or categorized. We've added a feature to Passel, that allows anyone to add tags to images. This allows us to use the power of the community to make Passel better, every day! This is a beautiful website for hand picked freebies like icons, UI kits, Overlays and many more. This is a graphic designer's treasure cove. This is a blog owned by a single graphic designer Rafi. He offers high quality Photoshop psd files. He offers some useful tips / tutorials to help designers who are interested in learning / improving design skills. Subtle Patterns is created and curated by, Atle Mo. Subtle patterns is a way of giving back to the next (and current) generation of web designers and developers or anyone else who needs some high quality patterns. You can find amazing photoshop plugins here. Designers can change the color of the patterns according to their webdesign pages. Adobe Color is a web-based application used to experiment with, create, and share color themes that you use in a project. You can choose websafe colors, which can be used on cross platforms and on different browsers. You have a color wheel and color schemes, so designers have plenty of options to work on. You can create the perfect color scheme using this website. It's very simple to use and t's more like color testing, which colors work on your websites. Coolors allows you to create, save and share the perfect color pallette within few seconds. It's free for use and available on IOS phones.Now You can, Create beautiful color schemes that always work together.Customize your colors precisely by adjusting temperature, hue, saturation, brightness and more. Export your palettes in several handy formats like PNG, PDF, SCSS, SVG or copy the permanent URLs. Create your profile and keep all your color schemes well organized with name and tags. Browse our collection of almost 31,000 free fonts shared by designers around the world. New Fonts are uploaded on a regular basis. Designers can also share their fonts by signing up and uploading their designs. Flaticon is the largest search engine of free icons in the world. The largest database of free icons available in PNG, SVG, EPS, PSD and BASE 64 formats. More than 288,688 vector icons grouped in 5,117 packs are available and it keeps increasing every month. Get instant access to the world's largest collection of icons using the premium version of Iconfinder Pro. You can host an icon library within your own UI. You can hire the world's best icon designers for your next icon design. You can also choose to join the fastest growing community of professional illustrators. IconArchive is a professional tag based icon search engine with more than 500,000 icons for web developers, end users and graphic artists. Also it is an inspiration source for new design ideas and a place to enjoy beautiful icons. You can collect, organize & share your favorite icons here with ease. If you want to customize your desktop, you can download icons for all operating systems, Win, Mac & Linux. Website or Software developers with demand for custom icon design could search for professional icon artists here. All icons are done by a single designer, so your user interface will look consistent. Vector icons are not merged and have preserved shapes. Pick a color and we will generate recolored versions of your PNG or SVG. Get a code to paste an icon right into your HTML. We have been creating 3-20 new line and filled icons every working day since 2012. Do you need an icon? Submit your idea. As its name suggests, FindIcons.com is an icon search engine helps you find free icons. We have the largest searchable free icons database in the world and both a sophisticated search filtering and result matching system make it possible for you to get an icon you need for every design task. DryIcons is a great resource depository for web developers and designers. It provides a huge collection of free icons available in variety of formats and sizes, stunning vector graphics, unique and modern-looking free templates built in accordance with W3C standards and great development and design tutorials. DryIcons works make a notable contribution to the web community - a place where everyone can find a piece for themselves.